The Trump administration still appears set to deliver this month an advanced fleet of F-35 Joint Strike Fighters to Turkey amid ongoing threats by Turkish President Recep Tayyip Erdogan to strike Israel and foment anti-Israel unrest among terrorist forces in the region, a move that is garnering criticism from lawmakers and regional experts. The Trump administration, despite opposition from Congress, has approved a deal to deliver Turkey's fighting forces 100 advanced F-35 war planes, sophisticated stealth aircraft capable of evading radars. Two pilots from Turkey's Air Force have been trained in the United States to fly the jets, which are scheduled to be formally transferred to Turkey by September 2019 if Congress fails in its legislative efforts to block the deal, according to industry trade reports. The decision to arm Turkey with these advanced planes has drawn concern from regional experts and lawmakers, who are urging the Trump administration to reconsider the sale following public efforts by Erdogan to unite the Islamic world against Israel in the wake of the Trump administration's decision to relocate the U.S. embassy in Israel from Tel Aviv to Jerusalem. The Senate moved late last month to block the sale, setting up a showdown with the Trump administration over the fate of the deal. Turkey has already stated it will turn to Russia or other nations if the United States fails to make good on the deal. 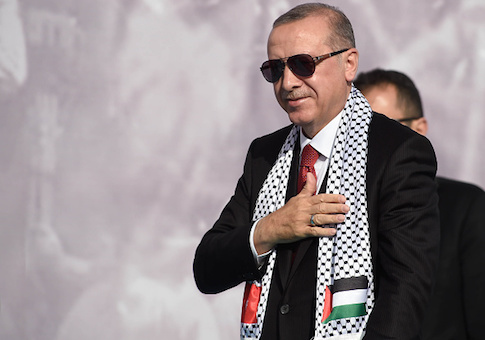 Erdogan's history of cozying up to terror organizations and fomenting unrest against Israel tops the list of concerns from those who oppose the sale. The Trump administration, despite this pushback, has moved closer to Erdogan's government, most recently in a bilateral powwow Monday in Washington, D.C.
Secretary of State Mike Pompeo met with Turkey's minister of foreign affairs on Monday to reaffirm the "spirit of allied partnership," according to a readout provided by the State Department. Turkish "Minister Çavuşoğlu and Secretary Pompeo exchanged views on bilateral and regional issues," according to the readout. "They reaffirmed their joint resolve to fight terrorism in all its forms and manifestations." Opposition to the sale in Congress has caused friction between the United States and Turkey, Cavusoglu said on Monday. "There really is tension between Ankara and Washington over a contract for the delivery of fifth generation fighters, but do not forget that Turkey, even before the contract with Russia, discussed the issue of air defense procurement with its ally," Cavusoglu was quoted as saying. The two diplomats also discussed the ongoing battle in Syria, where Turkey has taken a more prominent role in the war by attacking U.S.-allied Kurdish-aligned forces operating in the country. Three senators have already expressed opposition to the arms deal, offering a legislative measure late last month to block the sale. Sens. James Lankford (R., Okla.), Thom Tillis (R., N.C.), and Jeanne Shaheen (D., N.H.) introduced the measure as a response to what they described as Erdogan's "path or reckless governance and disregard for the rule of law," according to reports. "Turkey's strategic decisions regrettably fall more and more out of line with, and at times in contrast to, U.S. interests," Lankford was quoted as saying in a press release. "These factors make the transfer of sensitive F-35 technology and cutting-edge capabilities to Erdogan's regime increasingly risky." Some regional experts agree, calling the sale a dangerous move for the Trump administration, particularly as it pursues a national security strategy aimed at isolating America's enemies. "How ironic, then, that President Trump, Defense Secretary Jim Mattis, Secretary of State Mike Pompeo, and Sen. John McCain, chairman of the Senate Armed Services Committee, appear so sanguine about providing the next generation F-35 Joint Strike Fighter to Turkey, a country which was not only complicit with the Islamic State, but which also betrayed U.S. intelligence to it," Michael Rubin, a former Pentagon adviser and expert on rogue regimes, wrote in a recent essay on the matter. "The U.S. and Turkey could even go to war in the not-so-distant future." Turkey under Erdogan has repeatedly shared critical U.S. intelligence information with Iranian officials and has formed closer alliances with Tehran and China. "Erdogan has personally endorsed a designated al Qaeda financier and has stood behind Hamas, the Muslim Brotherhood, and almost every other radical Sunni Islamist group," Rubin wrote. "He has not only urged war against Israel, but also increasingly threatens other NATO members like Greece. Top aide Egemen Bagis has even threatened to use the Turkish military against Americans." Given the shape of events on the ground, the Trump administration should be reconsidering its decision to arm Turkey with advanced F-35 stealth fighters, Rubin wrote. "Under such circumstances, why would the U.S. trust Turkey with a military platform upon which the U.S. Navy, Marines, and Air Force will rely for the next several decades and which contains technology which Russia, Iran, and other enemies of the West are desperate to access?" he asked. "This is an issue long coming (I first testified in Congress on the topic of the provision of the F-35 to Turkey in 2010). But time is running out." This entry was posted in National Security and tagged Israel, Trump Administration, Turkey. Bookmark the permalink.